Poriyal is the Tamil word for dry curry or the stir-fry. Usually, vegetables are steamed and sauteed with simple spices. 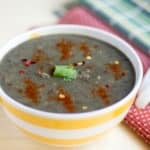 You can add onion or coconut for additional flavor. I love to add grated coconut to my poriyal. 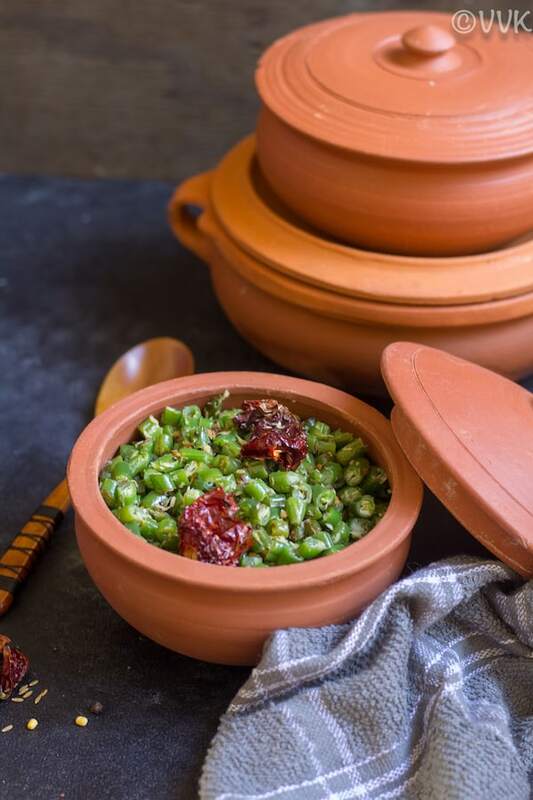 A South-Indian Thali is incomplete without this poriyal and you can prepare poriyal with veggies like beets, cabbage, carrot, potato, plantain, and even spinach. 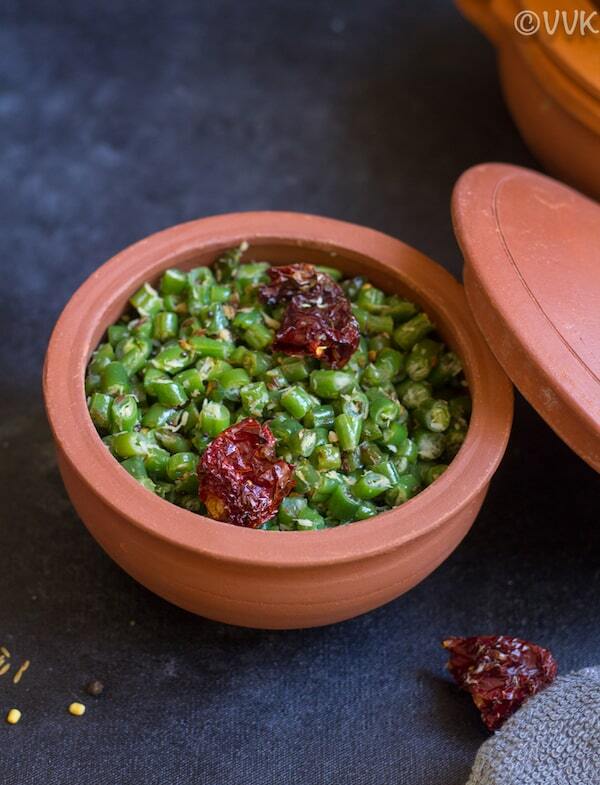 Today I am going to share the vibrant green beans poriyal. Make a simple tempering and saute the green beans. That’s it. Pretty much you prepare all the South Indian stir-frys similarly. But there are few exceptions like this ivy gourd curry or the brinjal curry. 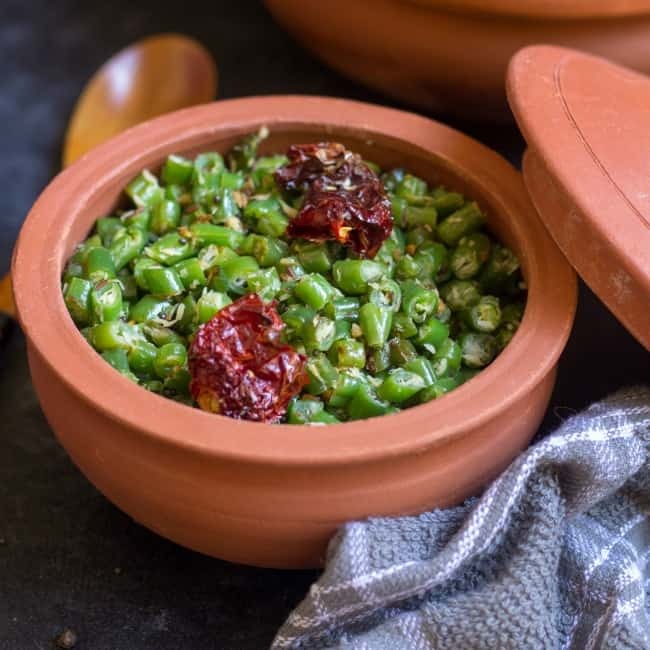 I prefer these simple stir-frys like these green beans as you can make them quickly during the weekdays and it’s an excellent side for any mixed rice or with rasam or even with sambar. 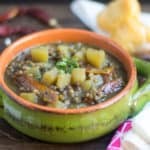 Yes, you can set zero as cooking time in Instant Pot. For tender and green vegetables I always prefer this setting and also I do a quick pressure release. These veggies just need the time that Instant Pot takes to build the pressure. Once the pot is pressurized and when the IP beeps, you can release the pressure quickly. With zero cooking time, you get a soft, tender yet crunchy and vibrant veggies without losing any nutrients. I highly recommend the steamer rack or the steaming basket accessory for the Instant Pot. It comes in handy for steaming all the vegetables. You add the water to the inner pot and place the trivet. And then keep the steamer rack with veggies on the trivet and cook the veggies using steam setting or manual/pressure cook setting for zero minutes. You don’t need to add water to the steamer rack. I know more than the written instruction, a video might make it simple and here it is for you all. Please do subscribe to my channel and help me spread the word. Add the chopped green beans to the steamer rack. Add 1 cup of water to the inner pot and place the trivet. Then keep the steamer basket with the beans on the trivet and close the lid. Make sure the vent is in the sealing position. Press the manual or the pressure cook button and set the cooking time to zero minutes at high pressure. When the IP beeps, move the vent to the venting positing and release the pressure quickly. Carefully open the lid and take the steamer basket out. Drain the water from inner pot and wipe it dry. Now place the inner pot and set it to saute mode. When the display shows “hot,” add the coconut oil. Then add the mustard seeds, cumin seeds, and hing. Mix them and then add the dried red chilies. Saute for 30 seconds. Add the cooked beans and the salt. Mix and cook for two minutes. Now add the grated coconut. Mix and cook for 30 seconds and turn off the heat. 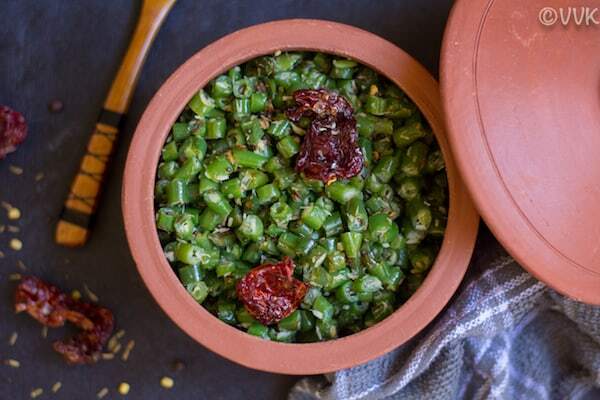 Serve hot with sambar rice or rasam rice or relish it as is. I used Kashmiri dried red chili variety. You can use other types too. 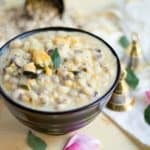 Instead of cumin seed tempering, you can temper the curry with urad dal and channa dal too. You can make a similar stir-fry with asparagus, brussels sprouts, etc. Simple yet delicious, tender and crunchy green beans stir-fry made in Instant Pot with minimal ingredients. 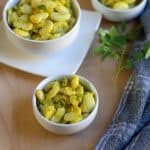 This vegan stir-fry with the flavors of coconut and coconut oil is a perfect rice accompaniment. When the display shows "hot," add the coconut oil. I’ve never tried this! But now I will! Thanks. Please do try and let me know how you liked it.